Unfortunately, July would not be the exception to violent incidents and killings in Cancún. During the first week of the month, there have already been several attacks and dead bodies found around the city. According to El Diario de Yucatán newspaper, the violent weekend began on Thursday July 13, when homemade bombs were thrown inside a local Spa; there were four women trapped inside the building, and on the outside a narcomanta (warning banner) was found. On Friday, subjects in a moving vehicle shot at a parked car in La Selva, Region 225. The day before yesterday, the police officer Valentín F.C., who was working as a traffic agent, was riddled with bullets in Región 97. While giving the statement, the Secretariat of Public Safety and Traffic confirmed the agent’s death. 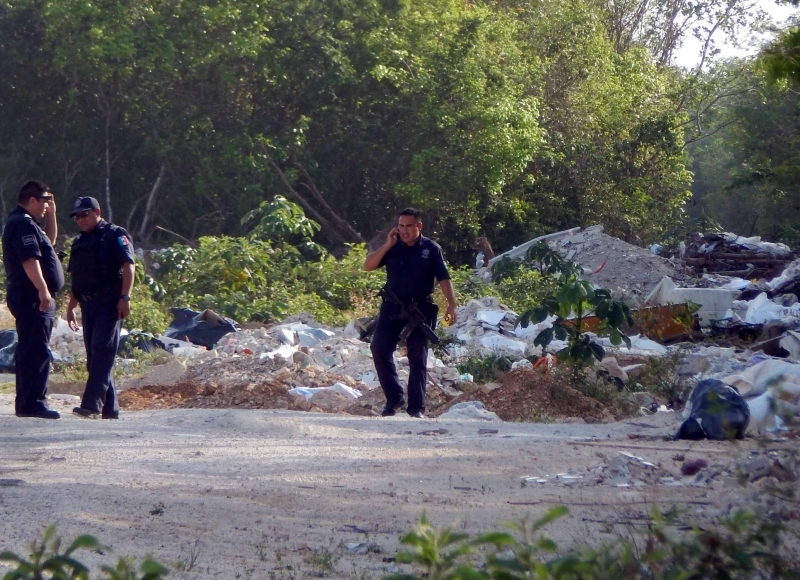 Police agents at the most recent crime scene in Cancún, where a bagged body was found. The Secretariat of Public Safety reported a subject was shot and injured in the Azul Bonampak neighborhood in region 235. Likewise, a person died near the stadium Cancun while resisting an assault. Nonetheless, these violent events did not stop, and continued up until yesterday, where a bagged body was abandoned on the sidewalk of Calle 70 in región 232. The body was found wrapped in a bedsheet inside a suitcase; folded in half, with its legs to its back. According to official figures and reports, this is the 87th violent death throughout the year; the sixth in July, and the fourth in the past 5 days.